The 360 panorama is an amazing type of photograph . Everything is visible in every direction. Stand right where I made these images, and see what I saw. Each of the panos will take you on an interactive tour of an amazing place, often at night. Use your mouse or touch screen to take a look around. I hope these 360 panoramas inspire you to go on your own adventures and stand somewhere wonderful. Airplane Boneyard - Take a night tour of this amazing Mojave Desert facility that does airplane mockups and crash simulations for Hollywood. 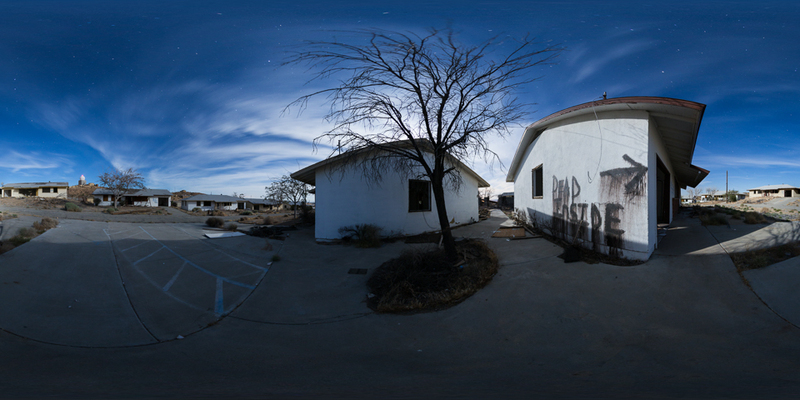 Boron Air Force Station & Federal prison - a 25 panorama night tour of this extensive ghost town in the Mojave Desert. Thompson Smelter ruins - Stare up at the full moon at the Stonehenge of Western Nevada. Berlin Nevada Ghost Town - step inside the mine supervisor's house at Berlin Ichthyosaur State Park. Valley Junkyard - Explore one of the Central Valley's most amazing junkyards under a full moon. Nevada Car Forest - Take a night tour of this amazing art installation in Goldfield, Nevada, featuring a field of cars, trucks, and buses stuck nose first into the ground. Madonna Inn - See four of my favorite rooms at this unique San Luis Obispo hotel. Library in the Woods - A small abandoned private library in Marin County. Eagle Field - 360 night tour of a WWII Air Base. Motorcoach Repair - A 360 night tour of a California facility that restores vintage buses. Paul's Junkyard - A 360 night tour of an amazing Mojave Desert junkyard that also stores movie cars. Abandoned Cement Plant - go up on the catwalk and check out the machinery. Desert Christ Park - Statues depict the Sermon on the Mount in this park near Joshua Tree. Desert Dinosaurs - The crumbling remains of some 70's dinosaur sculptures. Las Vegas Neon Museum - Take a 360 night tour and see some of Sin City's historic neon.